People are crazy about eating healthy food these days (I am no exception!). I generally buy a kilogram of oats every alternate month & look out for dishes to satisfy my taste buds. 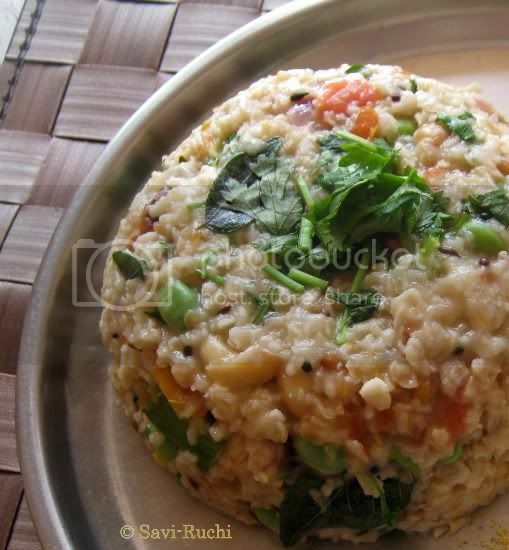 I, being a "not-so-big-fan" of oats, look for smart ways of consuming the oats. 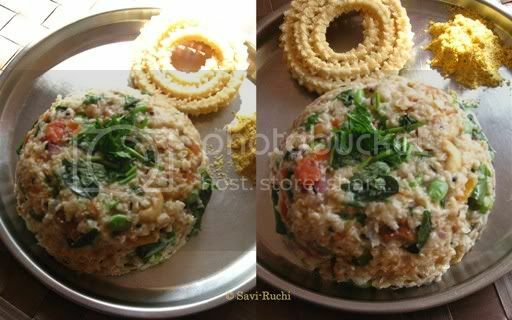 During one such search, I found the oats upma recipe in Saffola Oats book. Don't get alarmed by the exorbitant list of ingredients. They are all common ingredients & always stored at your pantry! Toast the oats for 1-2 minutes in the microwave |OR| use the stove top to roast the oats lightly. Keep it aside. Meantime, prepare the tempering. Heat oil + ghee in a kadai. When oil is hot, throw in mustard & cumin seeds, urad dal & cashew nuts. When nuts turn golden brown, add the curry leaves & green chillies. When curry leaves become crisp, add the onion & ginger. Saute for 2-3 minutes, until the onion changes its color (no need to brown the onions!). Add the tomato & saute for another 30 secs. Throw in the capsicum & saute again. Add the boiling water to the tempering. Follow with turmeric, salt & sugar. Finally add the toasted oats & cook the oats covered on a low heat for 2 minutes. Turn off the flame. 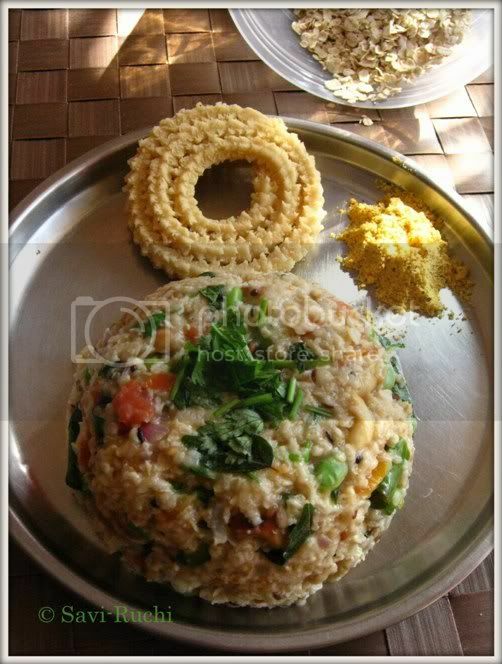 Garnish with coriander leaves & enjoy. It is very important to serve this dish hot, since it becomes goo-ey when it turns cold. Other vegetables like carrots, peas, french beans & potatoes could be added. Add a teaspoon of ghee just before serving for the extra richness. Masoppu means mashed greens. 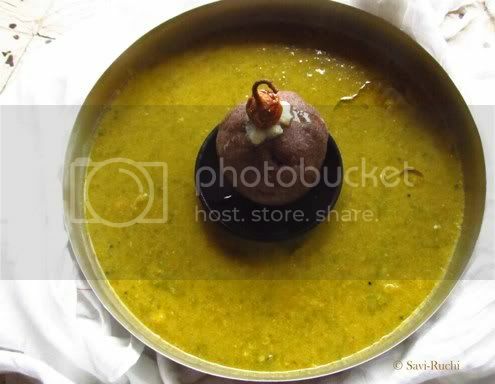 Masoppu is a South Karnataka specialty dish. 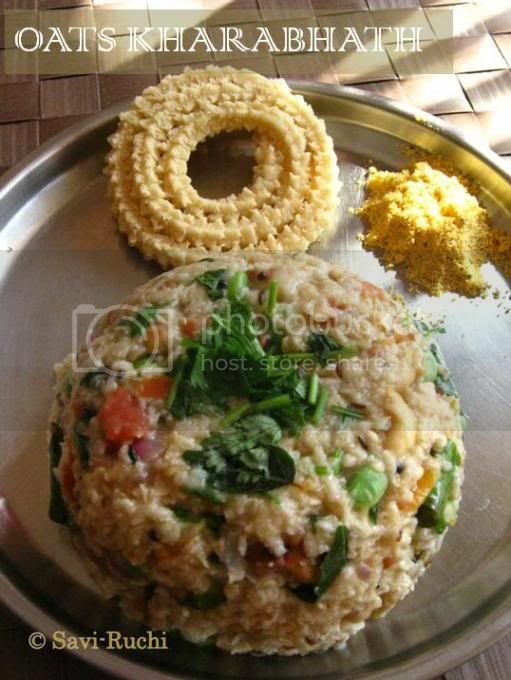 It is made using many different leafy vegetables & lentils. At least 3-5 different leafy vegetables are used to prepare this.There is another north Karnataka dish called muddipalya, which again loosely translates to mashed greens! The preparation of the two is also similar but the tastes are entirely different. 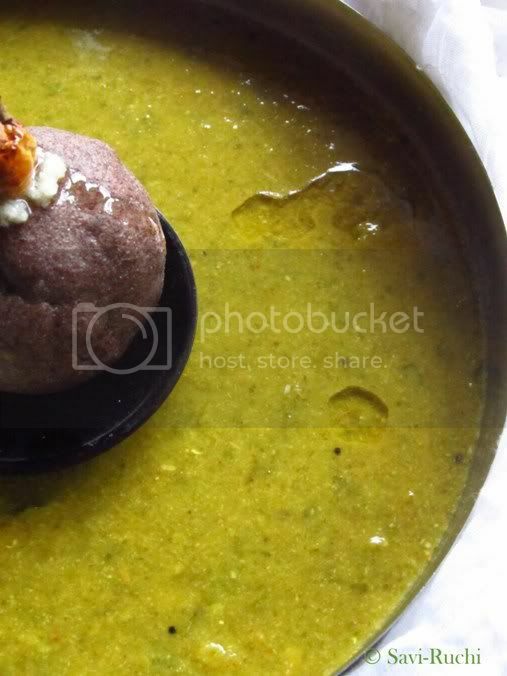 Muddi palya uses more lentils where as masoppu dominates with more greens! Being spent the half of my life in Mysore/Mandya, I wanted to try Mandya/Mysore style masoppu for a long time, but never got the recipe. I recently got it from my aunt. I cannot vouch about the authenticity of this recipe, but this sure satisfied my craving! Here is my aunt's recipe in my words! Wash the greens thoroughly in water. Chop them & keep aside. Chop the onions, tomato & brinjal(if using) into 1 inch cubes. Wash the dal in running water. Mix all the ingredients mentioned in set 1 along with 2 cups of water. Pressure cook it for 2-3 whistles. Reduce the heat after 3 whistles & cook for another 3-5 minutes.Turn off the heat. Let the pressure cooker cool. Warm the cumin seeds/jeera for a minute. Blend together the ingredients mentioned for spice paste. Make a smooth paste & scoop out the paste to a clean bowl. When the pressure is released from the cooker, remove the greens mixture & mash it well using a masher/hand blender or using a mixer. Heat a big pot. Add oil to the pot, followed by the ingredients mentioned for the tempering. When garlic gives out the aroma, add the spice paste to it & cook it for a minute. Throw in the mashed dal-greens mixture, followed by salt. Boil it on a medium heat for about 10minutes. 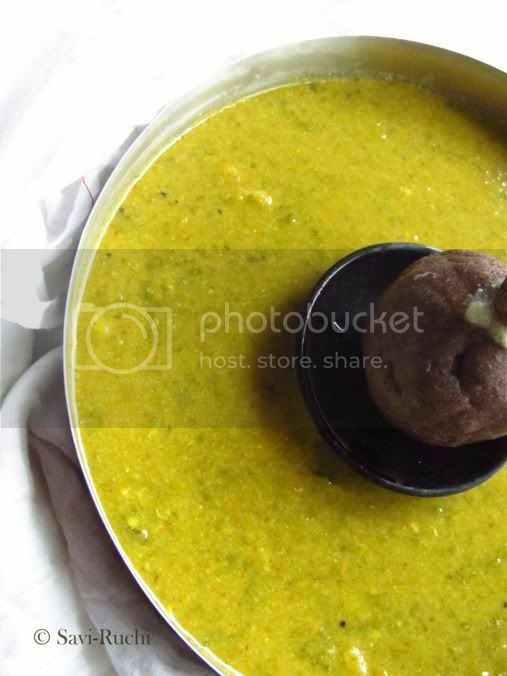 Serve it hot with rice, papad or ragi mudde/finger millet balls. Generally the greens that are added for making masoppu are dantina soppu (amaranth leaves), menthe soppu (fenugreek leaves), harive soppu, palak soppu (spinach), sabsige soppu (dill leaves). If you are in Karnataka, you can ask the vegetable vendor to give you mixed greens to make masoppu. They will mix some 6-7 kinds of leafy vegetables. Last note: Updated the previous post. Want to check if you guessed it right? !